For purposes of sections 6447-6447.3, and 6784(b), fumigation-handling activities are limited to employees involved in assisting with covering the tarpaulin at the end of the rows (shoveling); assisting in the overall operation, ensuring proper tarpaulin placement and condition, and changing cylinders (copiloting); operating tractor equipment (driving); supervising the fumigation operation; operating chemigation equipment and assisting in chemigation application and leak repair (chemigating); tarpaulin cutting; tarpaulin or chemigation equipment removal prior to the expiration of the entry restricted period; and other handling activities specified by the label. NOTE: Authority cited: Sections 11456, 12976, 12981, 14005, and 14102, Food and Agricultural Code. Reference: Sections 11501, 12981, and 14102, Food and Agricultural Code. 6445.5. Field Fumigation Licensing Requirements. When a field fumigation application is made by a licensed pest control business, the business must have a person holding a qualified applicator license or certificate with the field fumigation pest control subcategory supervising the work. NOTE: Authority Cited: Sections 11456, 11502, and 14005, Food and Agricultural Code. Reference: Sections 11501, 14001, and 14151, Food and Agricultural Code. NOTE: Authority Cited: Sections 11456, 12976, 14005, and 14102, Food and Agricultural Code. Reference: Sections 11501, 14006, and 14102, Food and Agricultural Code. 6446.1. Methyl Iodide Field Fumigation Methods. The provisions of this section and sections 6447.1, 6447.2, 6447.3, and 6784(b) pertain to field soil fumigation using methyl bromide. For purposes of these sections, field soil fumigation does not apply to golf courses, replant of individual vine or tree-sites (tree holes) less than one contiguous acre, raised-tarpaulin nursery fumigations of less than one acre, potting soil, and greenhouses and other similar structures. (a) In addition to the requirements of section 6428, the operator of the property to be treated shall submit a proposed work site plan to the commissioner for evaluation at least seven days prior to submitting a notice of intent. The proposed work site plan must include, but is not limited to, method of application to be used, acreage and identification of each application block to be treated, broadcast equivalent application rate to be used, description of the notification procedure to property operators pursuant to section 6447.1(b), description of any activities within the buffer zone(s) as specified in section 6447.2(c) and (d), description of any workday/work hour limitations as specified in section 6784(b)(3) and respiratory protection as specified on the label, and if applicable, description of the tarpaulin repair response plan. The commissioner shall retain the proposed worksite plan for one year after the expiration of the permit. (b) The commissioner, pursuant to section 6432, shall evaluate local conditions and the proposed work site plan. (c) The commissioner shall include at least the following when conditioning a permit: the buffer zone requirements, work-hour restrictions, notification requirements, any other restrictions to address local conditions, and if applicable, description of the tarpaulin repair response plan. The commissioner shall complete the evaluation and complete conditioning the permit prior to the submission of the notice of intent. (d) An application block must not exceed 40 acres unless approved by the Director. (e) Except for experimental research purposes pursuant to a valid research authorization issued according to section 6260, or a reduced volatile organic compound emission fumigation method approved pursuant to section 6452, tarpaulins must have a permeability factor of no more than 8 milliliters methyl bromide per hour, per square meter, per 1,000 parts per million of methyl bromide under the tarpaulin at 30 degrees Celsius, and be approved by the Department. This includes tarpaulins that have been tested for permeability and determined by the U.S. Environmental Protection Agency to qualify for at least 60 percent buffer zone reduction credit. The use of this tarpaulin will not allow the reduction of buffer zone distances specified on the label. A list of approved tarpaulins is available from the Department. (f) Tarpaulins must be buried under at least four inches of firmly packed soil at the end of the rows. The tarpaulins must remain in place for the time specified in section 6447.3. (g) County agricultural commissioners shall ensure that agricultural use of methyl bromide does not exceed 171,625 pounds in a township in a calendar month. County agricultural commissioners shall deny any permit or notice of intent that would cause the 171,625 pound limit to be exceeded. NOTE: Authority cited: Sections 11456, 12976, 12981, 14005 and 14102, Food and Agricultural Code. Reference: Sections 11501, 12981, 14006 and 14102, Food and Agricultural Code. 6447.1. Methyl Bromide Field Fumigation Notification Requirements. a) Notification to the Commissioner. (1) Notwithstanding section 6434, the operator of the property to be treated shall assure that the commissioner is notified (notice of intent) at least 48 hours prior to commencing fumigation. The notice of intent shall indicate the hour the fumigation is intended to commence and the information specified in section 6434(b). (2) The fumigation shall not commence sooner than the intended starting time or later than 12 hours after the intended starting time specified on the notice of intent. (3) If fumigation of an application block does not commence within the time specified in (a)(2), a new notice of intent must be submitted but no new 48-hour waiting period is needed unless required by the commissioner. (4) For multiple application blocks to be fumigated sequentially, the commissioner may allow one notice of intent that includes an application schedule for all the application blocks in lieu of a separate notice of intent for each application block to be fumigated. The schedule must specify the date and time each application block is intended to be fumigated. (b) Notification to Property Operators. (E) how to request subsequent notification of specific date and time of the fumigation. (2) The operator of the property to be treated shall assure that specific notification of the date and time of the start of the fumigation and anticipated expiration of buffer zones is provided to those persons notified in (b)(1) who request specific fumigation information. This specific fumigation notification shall be provided at least 48 hours prior to starting the fumigation. If a request for specific notification is received after the submission of the notice of intent and before the fumigation begins, the specific fumigation notification shall be provided prior to starting the fumigation, but the 48-hour requirement shall not apply. If the fumigation of an application block does not commence within the time frame specified in (a)(2), then a new notification must be provided to those persons who requested the information, but the 48-hour requirement shall not apply unless required by the commissioner. 6447.2. Methyl Bromide Field Fumigation Buffer Zone Requirements. (a) The commissioner shall set buffer zone sizes and durations based upon local conditions. The commissioner may not allow a buffer zone that is smaller or a duration that is less in permit conditions than those in Methyl Bromide Field Fumigation Buffer Zone Determination, Rev. 3/10, hereby incorporated by reference. (b) Two buffer zones, an inner and outer for each application block, shall be approved by the commissioner after the proposed worksite plan is submitted. (c) Inner Buffer Zone Restrictions. (1) The inner buffer zone must be at least 30 feet. (2) The operator of the property to be treated shall assure that no persons are allowed within the inner buffer zone except to transit on public and private roadways by vehicles or bicycles or to perform fumigation-handling activities. 3.	the signs are posted at intervals not exceeding 200 feet. (B) With approval from the commissioner, the inner buffer zone may extend across sites only where transit activities may occur, including streets, roads, roads within agricultural property, and highways. Written permission and posting requirements in 6447.2 (c)(3)(A) shall not apply. (d) Outer Buffer Zone Restrictions. (1) The outer buffer zone must be at least 60 feet. (2) The operator of the property to be treated shall assure that no persons are allowed within the outer buffer zone except to transit on public and private roadways by vehicles or bicycles, perform fumigation-handling activities, and commissioner-approved activities as identified in the restricted materials permit conditions. In no instance shall persons be allowed within the outer buffer zone for more than 12 hours in a 24-hour period. (3) The outer buffer zone may extend into other properties with written permission from the operators of these other properties. In no instances shall the outer buffer zone contain occupied residences or buildings, or occupied onsite employee housing while the outer buffer zone is in effect. The outer buffer zone must not extend into properties that contain schools, convalescent homes, hospitals, or other similar sites determined by the commissioner. (4) The outer buffer zone may extend across roads, highways, or sites approved by the commissioner. (e) The operator of the property to be treated shall assure that the operator of the other properties specified in (c)(3)(A) and (d)(3) above, notify the following persons that a buffer zone(s) has been established on the property: onsite employees, including those of a licensed pest control business or farm labor contractor. The notice to employees must be given prior to the commencement of the employee's work activity. Notification to farm labor contractor employees may be done by giving written notice to the farm labor contractor who shall then give the notice to the employee. Employee notification must be in a manner the employee can understand, and include information required in section 6447.1(b)(2). (f) The operator of the property to be treated shall assure that specific notification of the date and time of the start of the fumigation and anticipated expiration of buffer zones is provided to the other property operator, if the operator of the other property is required to notify his/her employees as specified in (e). This specific fumigation notification must be provided to the other property operator at least 48 hours prior to starting the fumigation. If the fumigation of an application block does not commence within the time frame specified in 6447.1(a)(2), then a new notification must be provided to the other property operator specified in (c)(3)(A) and (d)(3), but the 48-hour requirement shall not apply unless required by the commissioner. (g) No fumigant application with an outer buffer zone greater than 300 feet is permitted within ¼ mile of a school property unless the school is scheduled to be unoccupied during the application period and for 36 hours thereafter. 6447.3. Methyl Bromide Field Fumigation Methods. (A) Broadcast equivalent application rate must not exceed 400 pounds of methyl bromide per acre. 2. Closing shoes and compaction roller and the injection depth must be at least 24 inches. (C) Injection spacing must be 68 inches or less. (D) The soil must not be disturbed for at least four days (96 hours) following completion of injection to the application block. (B) Application must be made using an application tractor equipped with an air fan dilution system, and with a plow consisting of horizontal v-shaped blades mounted by a vertical arm to the tool bar. The fumigant must be injected laterally beneath the soil surface. (C) Injection depth must be at least 10 and no greater than15 inches. (D) Injection spacing must be 12 inches or less. (E) The tarpaulin must be laid down simultaneously (with fumigant injection) by tarpaulin-laying equipment mounted on the application tractor. (F) If using a tarpaulin that has been tested for permeability and determined by the U.S. Environmental Protection Agency to qualify for at least 60 percent buffer zone reduction credit, the tarpaulin must not be cut or perforated until a minimum of nine days following completion of injection to the application block. (G) Tarpaulin removal shall begin no sooner than 24 hours after tarpaulin cutting has been completed. (A) Broadcast equivalent application rate must not exceed 250 pounds of methyl bromide per acre. 3. Combination bed former and bed shaper. The chisels must be placed between the bed former and the bed shaper. The tractor with the tarpaulin-laying equipment must immediately follow the application tractor. (C) Injection depth shall be between 6 and 15 inches. The injection depth to preformed beds must not be below the bed furrow. (E) If using a tarpaulin that has been tested for permeability and determined by the U.S. Environmental Protection Agency to qualify for at least 60 percent buffer zone reduction credit, the tarpaulin must not be cut or perforated until a minimum of nine days following completion of injection to the application block. (F) If tarpaulins are removed before planting, tarpaulin removal shall begin no sooner than 24 hours after tarpaulin cutting has been completed. The entry restricted period must be at least six days, or 10 days if using tarpaulin described in (E). 3. be at least 14 days. If this option is chosen, the methyl bromide air concentration underneath the tarpaulin must test less than five parts per million before planting begins. (A) Broadcast equivalent Aapplication rate must not exceed 400 pounds of methyl bromide per acre. 2. Closing shoes and compaction roller. (C) Injection depth must be at least 20 inches. (D) Injection spacing must be 66 inches or less. (G) Tarpaulin removal must begin no sooner than 24 hours after tarpaulin cutting has been completed. (6) Drip System - Hot Gas. (A) Broadcast equivalent application rate must not exceed 225 pounds of methyl bromide per acre. (B) The fumigant must be injected beneath the soil surface at a minimum depth of one inch. (C) The portion of the drip system used in the fumigation must be physically disconnected from the main water supply during the fumigation to prevent possible contamination of the water supply. (D) All fittings and emitters underneath the tarpaulin must be buried in the soil to a minimum depth of one inch. (E) Prior to the start of the fumigation, all drip tubing must be checked for blockage, and the irrigation system connections and fittings checked for blockage and leaks using pressurized air and/or water. The end of each drip tubing must be placed under the tarpaulin prior to introduction of fumigant. (F) The tarpaulin must be placed and inspected for tears, holes, or improperly secured edges prior to fumigating. Repairs and adjustments must be made before the fumigation begins. (G) Prior to the start of the fumigation, all fittings above ground and outside of the tarpaulin must be pressure-tested with compressed air, water, or nitrogen gas to a maximum pressure of 50 pounds per square inch. A soap solution must be used to check the fittings for leaks if using air or nitrogen. All apparent leaks must be eliminated prior to the fumigation. All drip tubing with emitters connected to the distribution manifold not covered by the tarpaulin must be sealed to prevent fumigant loss through the emitters. (H) Prior to introducing the fumigant, the drip system must be purged of water by means of pressurized gas, such as CO2 or nitrogen. (I) The drip system must be purged prior to disconnecting any line containing the fumigant. (J) After purging, drip tubing must be pinched off and then disconnected from the distribution manifold. All disconnected tubing leading into the treated field must be secured to prevent gas from escaping. (K) All fittings used for connecting or disconnecting the heat exchanger to the irrigation system manifold must be of a positive shut-off design. (L) All persons must wear the eye protection specified on the label when working with a manifold system or tubing containing the fumigant under pressure. (M) The entire fumigation system (heater, valves, and manifold) must be purged of the fumigant at the end of each day's fumigation. (N) If using a tarpaulin that has been tested for permeability and determined by the U.S. Environmental Protection Agency to qualify for at least 60 percent buffer zone reduction credit, the tarpaulin must not be cut or perforated until a minimum of nine days following completion of injection to the application block. (O) If tarpaulins are removed before planting, tarpaulin removal shall begin no sooner than 24 hours after tarpaulin cutting has been completed. The entry restricted period must be at least six days, or 10 days if when using tarpaulin described in (N). (b)	Notwithstanding section 6770, the operator of the property shall assure that only persons performing fumigation-handling activities are allowed in an application block before the entry restricted period expires. Persons performing activities other than tarpaulin cutting, removal, and repair described in sections 6784(b)(3) and (5) shall wear a full-face respirator that meets the requirements specified on the label. (c) Notwithstanding subsection (a), a reduced volatile organic compound emission field fumigation method approved pursuant to section 6452 or a method for experimental research purposes pursuant to a valid research authorization issued according to section 6260 may be allowed. 6448. 1,3-Dichloropropene Field Fumigation – General Requirements. 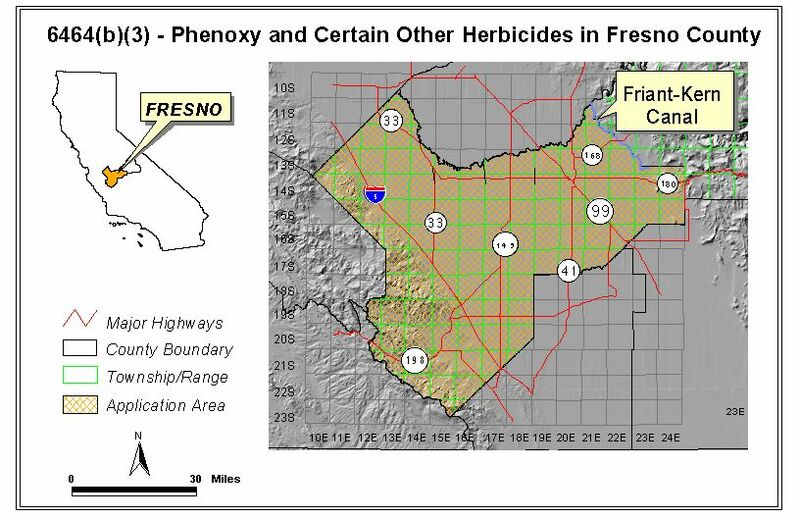 The provisions of section 6448.1 apply to field soil fumigation using 1,3-Dichloropropene within the Sacramento Metro, San Joaquin Valley, South Coast, Southeast Desert, or Ventura ozone nonattainment areas during the May 1 through October 31 time period. Raised-tarpaulin nursery fumigations of less than one acre, or replant of individual vine or tree-sites (tree holes) less than one contiguous acre, are not considered field soil fumigations under the provision of section 6448.1. Reference: Sections 11501, 12981, 14006, and 14102, Food and Agricultural Code. 6448.1. 1,3-Dichloropropene Field Fumigation Methods. (a) Broadcast equivalent application rate must not exceed 332 pounds of 1,3-Dichloropropene active ingredient per acre. (1) coarse soils - a minimum of 0.40 inches of water per acre. (2) loamy, moderately coarse, or medium texture soils - a minimum of 0.30 inches of water per acre. (3) fine texture soils - a minimum of 0.20 inches of water per acre. (c) If an application is made alternating fumigated and unfumigated areas (strip fumigation), the treated application block cannot be retreated with the same active ingredient between May 1 through October 31 during the same calendar year. (d) The 1,3-Dichloropropene field soil fumigation must be made using only the methods described in this section. 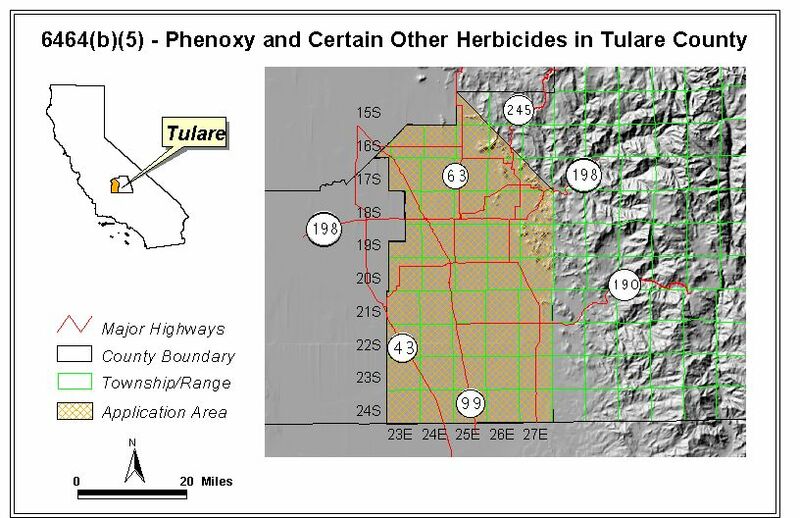 However within the San Joaquin Valley, Southeast Desert, or Ventura ozone nonattainment areas, methods (1) is prohibited; method (2) is prohibited unless applied as a broadcast fumigation using a tarpaulin that has been tested for permeability and determined by the U.S. Environmental Protection Agency to qualify for at least 60 percent buffer zone reduction credit; and method (5) is prohibited when 1,3-Dichloropropene is used in combination with chloropicrin unless applied as alternating fumigated and unfumigated areas (strip fumigation). In addition to labeling requirements for each of these methods, the following requirements shall apply. Chisel trace must be eliminated by use of tillage equipment to mix the soil to a depth of at least three inches. Broadcast fumigation must be followed by compaction of the soil surface. (A) Injection point must be at least 12 inches below the soil surface. (B) Chisel trace must be eliminated by use of tillage equipment to mix the soil to a depth of at least three inches. Broadcast fumigation must be followed by compaction of the soil surface. (C) Tarpaulins must be buried under at least four inches of firmly packed soil at the end of the rows. (D) If using a tarpaulin that has been tested for permeability and determined by the U.S. Environmental Protection Agency to qualify for at least 60 percent buffer zone reduction credit, the tarpaulin must not be cut or perforated until a minimum of nine days following completion of injection to the application block. (E) The operator of the property shall maintain a "tarpaulin repair response plan" pursuant to subsection (e). (3) Nontarpaulin/Shallow/Broadcast or Bed/Three Post-Fumigation Water Treatments. (A) Chisel trace must be eliminated by use of tillage equipment to mix the soil to a depth of at least three inches. Broadcast fumigation must be followed by compaction of the soil surface. 1. Water must be applied by an irrigation method that uniformly covers the treated area in the entire application block. 2. On the day of fumigation, the first water treatment must begin within 30 minutes of the completion of fumigation. A second post-fumigation water treatment must start no earlier than one hour prior to sunset on the day of fumigation and completed by midnight. 3. On the day following fumigation, a third post-fumigation water treatment must be applied starting no earlier than one hour prior to sunset and completed by midnight. 4. Additional post-fumigation water treatment(s) may be applied at any time provided the treatments required above are completed in the specified time periods. (4) Tarpaulin/Shallow/Bed/Three Post-Fumigation Water Treatment. (A) Chisel trace must be eliminated by use of tillage equipment to mix the soil to a depth of at least three inches. (B) Tarpaulins must be buried under at least four inches of firmly packed soil at the end of the rows. (C) If using a tarpaulin that has been tested for permeability and determined by the U.S. Environmental Protection Agency to qualify for at least 60 percent buffer zone reduction credit, the tarpaulin must not be cut or perforated until a minimum of nine days following completion of injection to the application block. 1. Water must be applied by an irrigation method that uniformly covers the untarped area in the entire application block. 2. On the day of fumigation, the first water treatment to the untarped areas must begin within 30 minutes of the completion of fumigation. A second post-fumigation water treatment to the untarped areas must start no earlier than one hour prior to sunset on the day of fumigation and completed by midnight. 3. On the day following fumigation, a third post-fumigation water treatment to the untarped areas must be applied starting no earlier than one hour prior to sunset and completed by midnight. (A) Injection point must be at least 18 inches below the soil surface. (D) The operator of the property shall maintain a "tarpaulin repair response plan" pursuant to subsection (e). (A) Drip system must be filled with water and tested for pressure variation, clogged emitters, and leaks before chemigation. The pressure must not exceed the pressure rating of the drip tape, and the pressure variation in the drip tape throughout the field must be less than three pounds per square inch. Drip system must be free of leaks and clogged emitters. (B) The tarpaulin must be placed and inspected for tears, holes, or improperly secured edges prior to fumigating. Repairs and adjustments must be made before the chemigation begins. (C) Ends of drip tape not covered by tarpaulin must be covered by at least two inches of soil. (D) After chemigation, the drip system must be flushed with a volume of water at least three times the volume of the mainline and laterals of the drip system. (1) If a tarpaulin is used, the operator of the property shall maintain a "tarpaulin repair response plan." The tarpaulin repair response plan must identify the responsibilities of the licensed pest control business and/or the permittee with regard to tarpaulin damage detection and repair activities. At a minimum, the tarpaulin repair response plan must indicate the parties responsible for the repair and incorporate the applicable elements listed in (2) below. (2) The "tarpaulin repair response plan" must state with specificity the situations when tarpaulin repair must be conducted. The situations should be based on, but not limited to, hazard to the public, residents, or workers; proximity to occupied structures, size of the damaged area(s); timing of damage; feasibility and response time of repair; and environmental factors such as wind speed and direction. (f) Notwithstanding subsection (d), a reduced volatile organic compound emission field fumigation method approved pursuant to section 6452 or a method for experimental research purposes pursuant to a valid research authorization issued according to section 6260 may be allowed. 6449. Chloropicrin Field Fumigation – General Requirements. 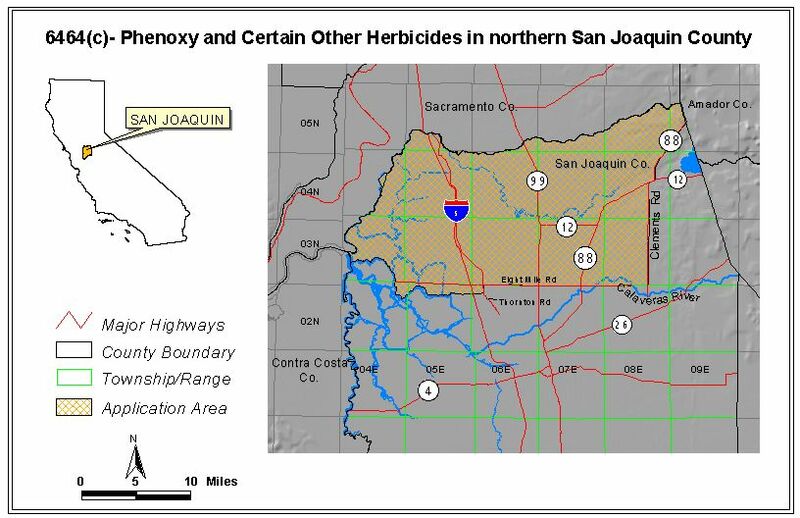 The provisions of section 6449.1 apply to field soil fumigation using chloropicrin within the Sacramento Metro, San Joaquin Valley, South Coast, Southeast Desert, or Ventura ozone nonattainment areas during the May 1 through October 31 time period. Raised-tarpaulin nursery fumigations of less than one acre or replant of individual vine or tree-sites (tree holes) less than one contiguous acre are not considered field soil fumigations under the provisions of section 6449.1. 6449.1. Chloropicrin Field Fumigation Methods. (3) 6447.3 (a)(4), 6447.3(a)(3) and (5) if applied as alternating fumigated and unfumigated areas (strip fumigation), and 6448.1(d)(2) if applied as a bed fumigation unless a tarpaulin that has been tested for permeability and determined by the U.S. Environmental Protection Agency to qualify for at least 60 percent buffer zone reduction credit is used. (b) If an application is made alternating fumigated and unfumigated areas (strip fumigation), the treated application block cannot be retreated with the same active ingredient between May 1 through October 31 during the same calendar year. 6450. Metam-Sodium, Potassium N-methyldithiocarbamate (metam-potassium), and Dazomet Field Fumigation – General Requirements. 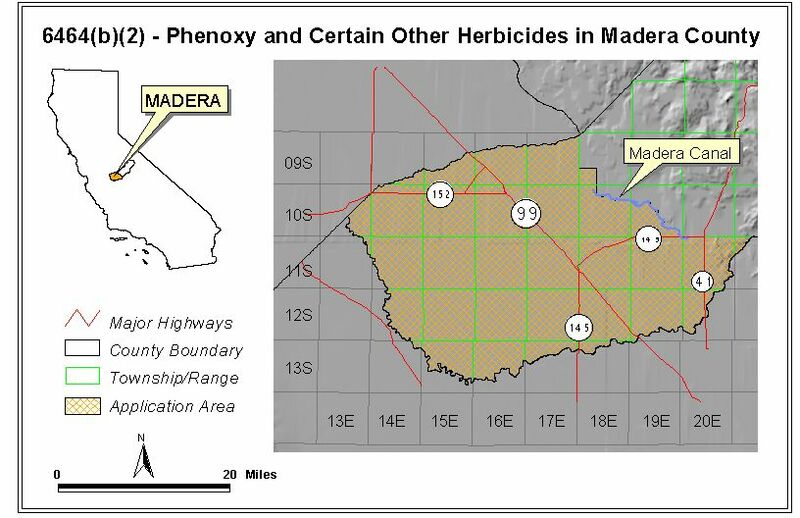 The provisions of sections 6450.1 and 6450.2 apply to field soil fumigation using metam-sodium, potassium N-methyldithiocarbamate (metam-potassium), or dazomet within the Sacramento Metro, San Joaquin Valley, South Coast, Southeast Desert, or Ventura ozone nonattainment areas during the May 1 through October 31 time period. Golf courses, tree applications for prevention of root graft disease transmission, wood decay uses, potting soil, replant of individual vine or tree-sites (tree holes) less than one contiguous acre, raised-tarpaulin nursery fumigations of less than one acre, and greenhouses and other similar structures are not considered field soil fumigations under the provisions of sections 6450.1 and 6450.2. 6450.1. Metam-Sodium and Potassium N-methyldithiocarbamate (Metam-Potassium) Field Fumigation Methods. (a) Broadcast equivalent application rate must not exceed 350 pounds active ingredient per acre for potassium N-methyldithiocarbamate (metam-potassium). (b) Fumigations must start no earlier than one hour after sunrise and must be completed no later than one hour before sunset except for the method described in subsection (d)(9), (10), and (11). (d) The metam-sodium or potassium N-methyldithiocarbamate (metam-potassium) field soil fumigation must be made using only the methods described in this section. However, within the San Joaquin Valley, Southeast Desert, or Ventura ozone nonattainment areas, methods (1), (4), and (9) are prohibited. In addition to labeling requirements for each of these methods, the following requirements shall apply. (1)	Sprinkler/Broadcast or Bed/One Post-Fumigation Water Treatment. 2. On the day of fumigation, one post-fumigation water treatment must begin within 30 minutes of the completion of fumigation. 3. Any additional post-fumigation water treatment(s) may be applied at any time. (2) Sprinkler/Broadcast or Bed/Two Post-Fumigation Water Treatments. 2. On the day of fumigation, the first post-fumigation water treatment must begin within 30 minutes of the completion of fumigation. A second post-fumigation water treatment must start no earlier than one hour prior to sunset on the day of fumigation and completed by midnight. 3. Additional post-fumigation water treatment(s) may be applied at any time provided the treatments required above are completed in the specified time periods. (3) Sprinkler/Broadcast or Bed/Three Post-Fumigation Water Treatments. 3. On the day following fumigation, a third post-fumigation water treatment, be applied starting no earlier than one hour prior to sunset and completed by midnight. (4) Nontarpaulin/Shallow/Broadcast or Bed/One Post-Fumigation Water Treatment. (A) Fumigation must be completed in compliance with the post-fumigation water treatments pursuant to subsection (d)(1)(A). (5) Nontarpaulin/Shallow/Broadcast or Bed /Two Post-Fumigation Water Treatments. (A) Fumigation must be completed in compliance with the post-fumigation water treatments pursuant to subsection (d)(2)(A). (6) Nontarpaulin/Shallow/Broadcast or Bed/Three Post-Fumigation Water Treatments. (A) Fumigation must be completed in compliance with the post-fumigation water treatments pursuant to subsection (d)(3)(A). (A) Drip system must be filled with water and tested for pressure variation, clogged emitters, and leaks before chemigation. The pressure must not exceed the pressure rating of the drip tape and the pressure variation in the drip tape throughout the field must be less than three pounds per square inch. Drip system must be free of leaks and clogged emitters. (B) After chemigation, the drip system must be flushed with a volume of water at least three times the volume of the mainline and laterals of the drip system. (8) Rotary Tiller/Power Mulcher/Soil Capping. (A) Application equipment must be followed immediately by soil compaction equipment. (A) The fumigant must be applied with at least four inches of water per acre. (10) 1:00 AM Start/Nontarpaulin/Shallow/Broadcast/Two Post-Fumigation Water Treatments. (A) The fumigation application must start no earlier than 1:00 a.m.
(B) Fumigation must be completed in compliance with the post-fumigation water treatments pursuant to subsection (d)(2)(A). i. The shanks must be set on three application tool bars, with the bars spaced 12 to 16 inches apart from front to back. The shanks must be staggered on each tool bar to produce a final overall shank spacing of 9 to 11 inches. ii. Injection depth on each shank must be 3 to 4 inches, 6 to 7 inches, and 9 to 10 inches. iii. Nitrogen must be used to purge the system before applicator bar is lifted out of the ground at any time. iv. The application tool bars must be followed by a ring roller that is at least as wide as the application tool bars, with four gauge wheels controlled by hydraulic cylinders to control depth and/or pressure; or with a coil packer that is at least as wide as the application tool bars. (11) 4:00 AM/ Start/Sprinkler/Broadcast or Bed/Two Post-Fumigation Water Treatments. (B) Fumigation must start no earlier than 4:00 a.m.
(C) Fumigation must be completed in compliance with post-fumigation water treatments pursuant to (d)(2)(A). (A) Notwithstanding (a), in the Sacramento Metro and South Coast ozone nonattainment areas, broadcast equivalent application rate must not exceed 246 pounds active ingredient per acre for metam-sodium or 270 pounds active ingredient per acre for potassium N-methyldithiocarbamate (metam-potassium). 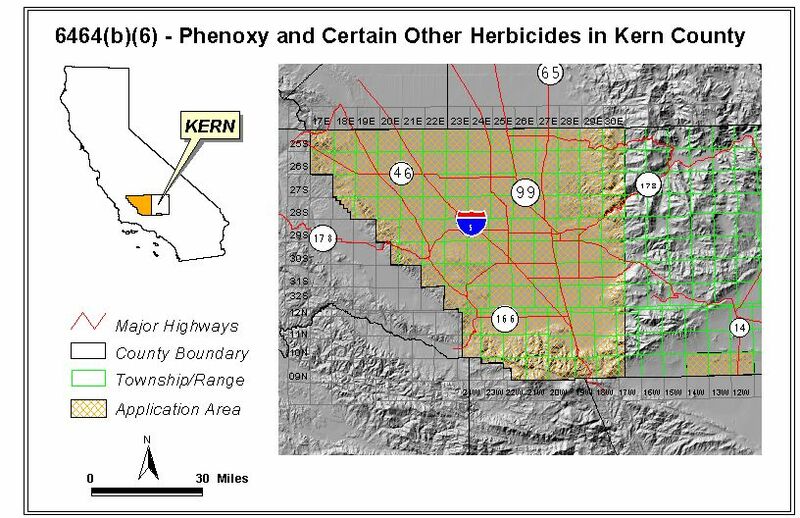 In the San Joaquin Valley, Southeast Desert, and Ventura ozone nonattainment areas, broadcast equivalent application rate must not exceed 90 pounds active ingredient per acre for metam-sodium or 98 pounds active ingredient per acre for potassium N-methyldithiocarbamate (metam-potassium). (e) Notwithstanding subsection (d), a reduced volatile organic compound emission field fumigation method approved pursuant to section 6452 or a method for experimental research purposes pursuant to a valid research authorization issued according to section 6260 may be allowed. 6450.2. Dazomet Field Fumigation Methods. (a) Fumigations must start no earlier than one hour after sunrise and must be completed no later than one hour before sunset. (b) The field soil fumigation using dazomet is limited to methods specifically identified in the labeling. In addition to labeling requirements for each identified method, the fumigation must comply with the following. (A) Water must be applied by an irrigation method that uniformly covers the treated area in the entire application block. (B) On the day of fumigation, the first water treatment must consist of at least 0.20 inches of water, beginning within 30 minutes of the completion of fumigation. A second post-fumigation water treatment must consist of at least 0.20 inches of water applied starting no earlier than one hour prior to sunset on the day of fumigation and completed by midnight. (C) On the day following fumigation, a third post-fumigation water treatment must consist of at least 0.20 inches of water, and must be applied starting no earlier than one hour prior to sunset and completed by midnight. (D) On the second day following fumigation, a fourth post-fumigation water treatment must consist of at least 0.20 inches of water, and must be applied starting no earlier than one hour prior to sunset and completed by midnight. (E) Additional post-fumigation water treatment(s) may be applied at any time provided the treatments required above are completed in the specified time periods. (c) Notwithstanding subsection (b), a reduced volatile organic compound emission field fumigation method approved pursuant to section 6452 or a method for experimental research purposes pursuant to a valid research authorization issued according to section 6260 may be allowed. 6451. Sodium Tetrathiocarbonate Field Fumigation - General Requirements. 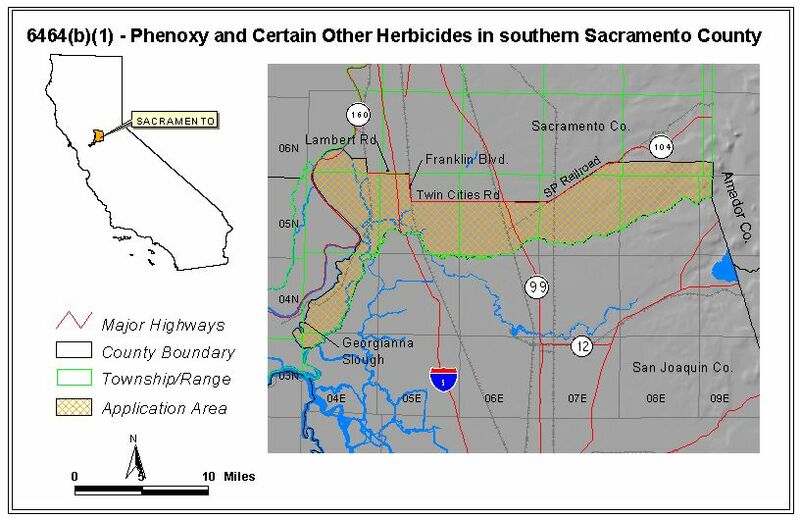 The provisions of section 6451.1 apply to field soil fumigation using sodium tetrathiocarbonate within the Sacramento Metro, San Joaquin Valley, South Coast, Southeast Desert, or Ventura ozone nonattainment areas below during the May 1 through October 31 time period. Replant of individual vine or tree-sites (tree holes) less than one contiguous acre, and raised-tarpaulin nursery fumigations of less than one acre, and greenhouses and other similar structures are not considered field soil fumigations under the provisions of section 6451.1. 6451.1 Sodium Tetrathiocarbonate Field Fumigation Methods. (a) The field soil fumigation of sodium tetrathiocarbonate is limited to methods specifically identified in the labeling. (b) Notwithstanding subsection (a), a reduced volatile organic compound emission field fumigation method approved pursuant to section 6452 or a method for experimental research purposes pursuant to a valid research authorization issued according to section 6260 may be allowed. 6452. Reduced Volatile Organic Compound Emissions Field Fumigation Methods. 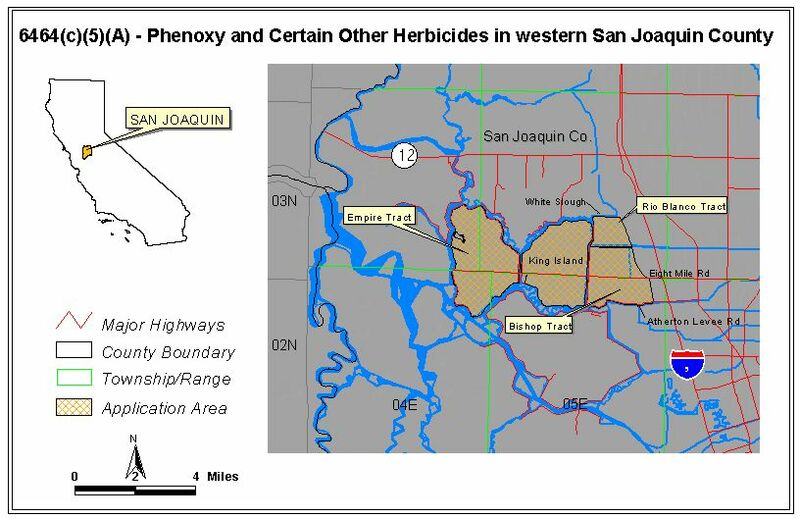 (a) For the Sacramento Metro and South Coast ozone nonattainment areas, the Director may approve use of a field fumigation method not described in sections 6447.3, 6448.1, 6449.1, 6450.1, 6450.2, and 6451.1 if the request is accompanied by scientific data documenting the volatile organic compound (VOC) emissions. The emission rating specified in section 6881 or the maximum emission rate (emission rating multiplied by the maximum broadcast equivalent application rate must be no greater than any one of the methods for the same fumigant described in sections 6447.3, 6448.1, 6449.1, 6450.1, 6450.2, and 6451.1. (B) The maximum emission rate (emission rating multiplied by the maximum broadcast equivalent application rate) is no greater than any one of the methods for the same fumigant allowed for use in the San Joaquin Valley, Southeast Desert, and Ventura ozone nonattainment areas as specified in sections 6447.3, 6448.1, 6449.1, 6450.1, 6450.2, or 6451.1. (3) the conditions studied represent agricultural fields fumigated. (d) The Director shall publish a notice of interim approval for a field fumigation method on the Department’s Web site. The interim approval expires three years after the date of approval. Reference: Sections 11501, 14006, and 14102. 6452.1 Fumigant Volatile Organic Compound Emission Records and Reporting. (a) Any person who applies field fumigants shall maintain records of fumigant applications pursuant to section 6624. (b) Any person who applies field fumigants shall report the information specified in section 6626. 6452.2 Volatile Organic Compound Emission Limits. (1) If a VOC emission limit is in effect pursuant to (a) that limit must remain in effect until the commissioner does not condition permits to include a fumigant emission allowance specified in (c)(1) or (d)(1), and does not deny any permit or notice of intent specified in (c)(2) or (d)(2) in order to comply with the fumigant emission limit for two consecutive years. (b) The Director shall calculate the field fumigant VOC emission limits specified in (a) by subtracting the nonfumigant pesticide VOC emissions from the total agricultural and structural VOC emissions inventory benchmarks. Nonfumigant pesticide product emissions will be the summation of the pounds of each pesticide product used multiplied by the VOC content (emission potential) for the specific product. (1) Condition permit to include fumigant emission allowances. (2) Deny any permit or notice of intent that would cause the fumigant limit to be exceeded. (3) Condition permit to prohibit or require any of the methods allowed by sections 6447.3(a), 6448.1(d), 6449.1(a), 6450.1(d), or 6452 during the May 1 through October 31 time period. (1) The Director establishes a fumigant emission allowance for each permittee, based on information provided the commissioners within the ozone nonattainment area. The total allowances in each ozone nonattainment area must not exceed the fumigant limit established for that area. Commissioners shall issue permits or amend existing permits to comply with the fumigant emission allowance(s) established by the Director. Commissioners shall deny any notice of intent that does not comply with the permittees’ fumigant emission allowances. (2) Commissioners deny any permit or notice of intent that would cause the fumigant limit to be exceeded. (3) Commissioners condition permits to prohibit or require any of the methods allowed by sections 6447.3(a), 6448.1(d), 6449.1(a), 6450.1(d), or 6452 during the May 1 through October 31 time period. (e) No person may apply a field fumigant during the May 1 through October 31 time period in an ozone nonattainment area for which a fumigant emission limit has been established pursuant to (a), unless their restricted material permit includes conditions specified in (c) or (d), or notice of intent is approved in writing. (f) For the San Joaquin Valley ozone nonattainment area, if the difference between emissions in the most recent emissions inventory report and the 6,700,000 pound (18.1 tons per day) benchmark for this area is five percent or less of the benchmark or exceeds this benchmark during the May 1 through October 31 time period, the provisions of section 6884 shall apply. 6452.3 Field Fumigant Volatile Organic Compound Emission Allowances. (4) identification of each site to be fumigated. 6453. Chloropicrin and Methyl Bromide – Nursery and Commodity Fumigation. (a) When chloropicrin or methyl bromide is used, singly or in combination, to treat nursery potting soils or soil mixes, nursery stock, and other agricultural commodities, appliances, or equipment, it shall be done in a properly sealed fumigation chamber, railroad car, or truck trailer, or under a gas confining tarp approved by the commissioner or director. The commissioner or director may specify the fumigation period. Injection shall be made in a manner that minimizes gas loss. (b) When chloropicrin or methyl bromide is applied singly or in combination, the commissioner or director may require the treatment site or fumigation chamber to be posted and attended for a specified time after application. 6454. Chloropicrin and Methyl Bromide-Structural Fumigation. This section supplements the methyl bromide fumigation requirements found in the Business and Professions Code and Title 16 of the California Code of Regulations, as well as directions for use given on methyl bromide product labeling. (3)For fumigations utilizing 80 pounds or more, a distance in feet equal to two (2) times the total poundage of methyl bromide applied must exist. (b) Structures shall be covered with the required tarpaulins or sealed prior to fumigation. The "acceptable" tarpaulin used in fumigations shall be vinyl coated with a minimum weight of seven (7) ounces per square yard (or having a fumigant retention capability equal to or greater than that provided by the seven-ounce weight tarpaulin). The vinyl coating shall not be worn, cracked, abraded, or similarly damaged to the extent that any of the underlying fabric shows through the vinyl coating. (c) All cuts, tears, holes, or similar damage to tarpaulins shall be repaired prior to introduction of the fumigant. Temporary repairs to damaged tarpaulins shall be made with vinyl coated self-adhesive tape, or the damaged area of the tarpaulin may be rolled and clipped so the tarpaulin's fumigant gas retention capability is maintained. (e) When tarpaulins are used, all sides of the structure shall be draped to the ground. Sand snakes, water snakes, or similar weights shall be used to seal the base of the tarpaulins to the ground. Prior to the placement of these snakes or weights, the soil adjacent to the structure foundation shall be thoroughly watered. (f) Chloropicrin shall be used as a warning agent when fumigating a structure unless specifically prohibited by regulations or product labeling. (g) A fan shall be used to disperse chloropicrin and methyl bromide within the structure. Chloropicrin shall be released into the airstream of the fan when it is introduced (either by itself or in combination with methyl bromide). (h) Aeration of the fumigated structure shall not begin earlier than one hour after sunrise or later than one hour before sunset. The sunrise and sunset times published in the local newspaper shall be used to establish aeration timing. (2) Ten (10) feet for fumigations utilizing more than 50 pounds of methyl bromide. (j) If any nearby structure is taller than the fumigated structure and the distance between the structures is equal to or less than the distance indicated in the following table, the convection tubing or ducting outlet shall be located as high as the top of the roof of the tallest structure. (3) The number of feet equaling two (2) times the pounds of methyl bromide used for fumigations utilizing more than 80 pounds. (1) Each exhaust fan shall have a capacity of at least 5,000 cubic feet per minute (cfm). (2) Convection tubing or ducting shall be large enough to fit over the exhaust fan housing and shall be securely attached to the housing prior to aeration. (3) Exhaust fans and convection tubing shall be installed in a manner which does not present a hazard to workers and the public. (m) If exhaust fans and convection tubing or ducting are installed after the fumigation has begun, the installer shall wear self-contained breathing apparatus (SCBA) respiratory protection. (2) If the fumigated structure's windows were closed during the fumigation: (A)The space between the fumigated structure and the tarpaulin shall be aerated prior to tarpaulin removal through convection tubing or ducting. (B) After the tarpaulins are removed, the fumigated structure shall be aerated through convection tubing or ducting until the methyl bromide concentration is 250 ppm or less. Reference: : Sections 11501, 12981, 14006, and 14102, Food and Agricultural Code. 6455. Sulfuryl Fluoride-Structural Fumigation, Aeration, and Reentry. NOTE: Authority: Sections 12976, 12981, 14005, 14102 and 15203, Food and Agricultural Code. NOTE: Authority cited: Sections 407, 12976, 12981, 14005 and 14102, Food and Agricultural Code. (a) Bentazon shall not be applied in Del Norte or Humboldt Counties. (b) Bentazon shall not be used in the production of rice. NOTE: Authority cited: Sections 11456, 12976, 13145, 14005 and 14006, Food and Agricultural Code. Reference: Sections 13145, 13150 and 14006, Food and Agricultural Code. (b) Pesticides containing aldicarb shall not be applied to cotton, potatoes, sugar beets, dried beans, citrus, or field-grown ornamentals from September 1 to March 1 of each year. Reference: Sections 12976 and 13150, Food and Agricultural Code. (a) Discharged more than ten feet above the crop or target. Discharge shall be shut off whenever it is necessary to raise the equipment over obstacles such as trees or poles. (b) Applied when wind velocity is more than ten miles per hour. (B) Each individual nozzle shall be equipped with a positive action valve. (2) Aircraft nozzles shall not be equipped with any device or mechanism which would cause a sheet, cone, fan, or similar type dispersion of the discharged material except as otherwise provided. (3) Aircraft boom pressure shall not exceed 40 pounds per square inch. (4) Aircraft nozzles shall be equipped with orifices directed backward parallel to the horizontal axis of the aircraft in flight. (5) Fixed wing aircraft and helicopters operating in excess of 60 miles per hour shall be equipped with jet nozzles having an orifice of not less than one-sixteenth of an inch in diameter. (C) The Microfoil (R) boom (a coordinated spray system including airfoil-shaped nozzles with each orifice not less than 0.013 inches in diameter) or equivalent type approved by the director. Orifices shall be directed backward parallel to the horizontal axis of the aircraft in flight. (B) Low pressure fan nozzles with a fan angle number not larger than 80 degrees and fan nozzle orifice not smaller than 0.2 gallon per minute flow rate or equivalent, and operated at a boom pressure not to exceed 15 pounds per square inch. NOTE: Authority cited: Sections 11456, 12781, 12972, 12976, 14001, 14005 and 14102, Food and Agricultural Code. Reference: Sections 11501, 14006, 14033 and 14102, Food and Agricultural Code. 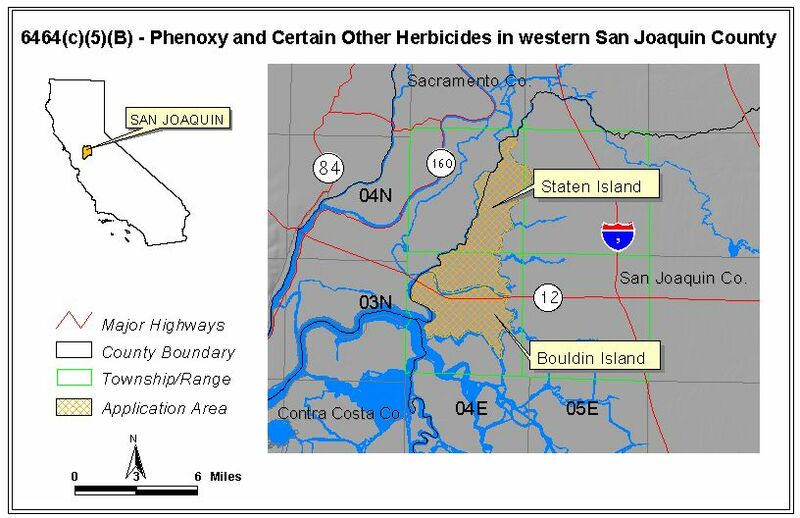 The provisions of this section apply to propanil used in Butte, Colusa, Glenn, Placer, and Yuba counties; the portion of Sutter County situated north of Sankey Road; and the portion of Yolo County situated north of State Highway 16. (a) No emulsifiable concentrate formulation shall be applied. (1) Aerial applications shall not be made within four miles of cultivated commercial plantings of prunes. (2) No more than 720 acres may be treated by aircraft within each county per day. (3) Each operating aircraft nozzle shall produce a droplet size, in accordance with the manufacturer's specifications, not less than 600 microns volume median diameter (Dv0.5) with not more than ten percent of the diameter by volume (Dv0.1) less than 200 microns. (c) Notwithstanding (b)(1), the Butte county agricultural commissioner may allow the California Rice Research Station to make aerial applications within four miles of cultivated commercial plantings of prunes according to a work plan submitted to and approved by the Butte county agricultural commissioner. The work plan shall include: the largest individual site that may be treated per application; total acres that may be treated per day which shall not exceed 45 acres; the minimum distance that must be maintained from cultivated commercial plantings of prunes and the application site; and any additional procedures to protect cultivated commercial plantings of prunes within four miles of the application site. (1) Ground applications shall not be made within one mile of cultivated commercial plantings of prunes, except as provided in (A) and (B) below. 3. A positive airflow away from cultivated commercial plantings of prunes is present throughout the entire application. 1. The commissioner shall provide onsite monitoring of all applications. 2. The commissioner shall provide for notice to, and opportunity to comment by, any owner of cultivated commercial plantings of prunes within one-half mile of the application. (2) Each operating nozzle shall produce a droplet size, in accordance with the manufacturer's specifications, not less than 500 microns volume median diameter (Dv0.5) with not more than ten percent of the diameter by volume (Dv0.1) less than 200 microns. NOTE: Authority cited: Sections 11456, 12781, 14001, 14005, and 14102, Food and Agricultural Code. Reference: Sections 14006 and 14007, Food and Agricultural Code. 6464. 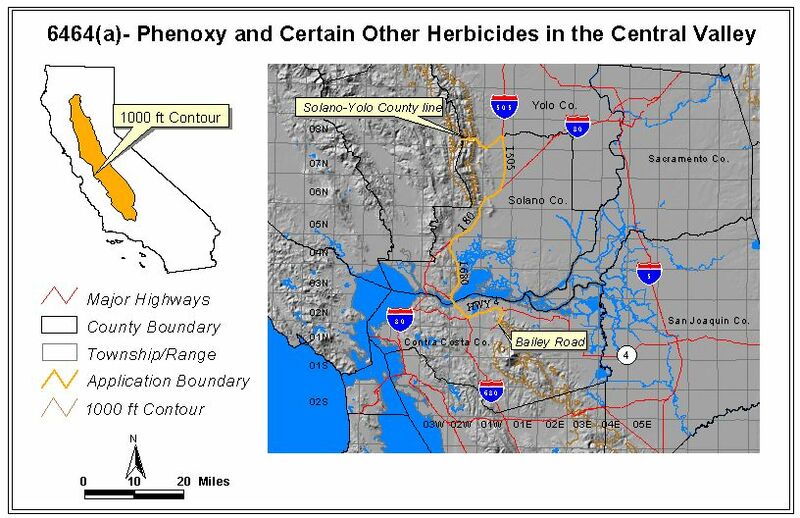 Phenoxy and Certain Other Herbicides. (a) The provisions of this subsection apply to Dicamba, 2,4-dichlorophenoxyacetic acid, 2,4-dichlorophenoxybutyric acid, 2,4-dichlorophenoxypropionic acid, 2-methyl-4-chlorophenoxyacetic acid, and Propanil herbicides when used in the Central Valley below one thousand feet elevation during the period beginning March 16 and continuing through October 15 of each calendar year. The boundary of this area through the Sacramento-San Joaquin Delta where the elevation does not reach 1,000 feet is as follows: Commencing from the point where Bailey Road intersects 1,000 feet elevation in Contra Costa County, thence north along Bailey Road to its intersection with Highway 4, thence west along Highway 4 to its intersection with Highway 680, thence north along Highway 680 to its intersection with Highway 80, thence northeast along Highway 80 to its intersection with Highway 505, thence north along Highway 505 to its intersection with the Solano-Yolo County line, thence west along the Solano-Yolo County line to its intersection with 1,000 feet elevation. (2) Unless expressly authorized by permit no herbicide in an ester form shall be applied. (b) The requirements of the subsection apply to Dicamba, 2,4-dichlorophenoxyacetic acid, 2,4-dichlorophenoxybutyric acid, 2,4-dichlorophenoxypropionic acid, 2-methyl-4-chlorophenoxyacetic acid, and Propanil herbicides during the period beginning March 16 and continuing through October 15 of each calendar year when used in the following areas. (1) That portion of Sacramento County bounded by a line beginning at the junction of the Mokelumne River and Georgianna Slough; thence in a northerly direction following the meanderings of the Georgianna Slough to its junction with the Sacramento River near Walnut Grove; thence northwesterly along the Sacramento River to the junction of the north end of Randall Island and the north end of Snodgrass Slough; thence southeasterly along Snodgrass Slough to a point 1.0 miles due north of Lambert Road (first Standard Parallel north) which is the common boundary line between Section 27 and 34, T6N-R4E; thence due east along said line to its intersection with the Southern Pacific Railroad tracks; thence southerly along the Southern Pacific Railroad tracks to its intersection with Lambert Road (first Standard Parallel north); thence easterly along Lambert Road to its intersection with Franklin Boulevard, then southerly along Franklin Boulevard to its intersection with Twin Cities Road; thence easterly along Twin Cities Road to its intersection with the Southern Pacific Railroad Tracks (Amador Branch); thence northeasterly along said tracks to their intersection with the first Standard Parallel north; thence easterly along the first Standard Parallel north to its intersection with the Sacramento-Amador County line; thence southerly along the Sacramento-Amador County line to its junction with the Sacramento-Amador-San Joaquin County lines; thence westerly along the Sacramento-San Joaquin County line to the point of beginning. (2) All of Madera County west and south of a line beginning at the east boundary of Range 17 east and the Madera County-Merced County boundary line; thence south to the northwest corner of Section 30, Township 9 South, Range 18 east; thence east to the northeast corner of Section 28, Township 9 south, Range 18 east; thence south to the intersection of the Madera Canal in the northeast 1/4 of Section 9, Township 10 south, Range 18 east; thence southeasterly along the Madera Canal to the northeast corner of Section 1, Township 11 south, Range 19 east; thence east along the north boundary line of Township 11 south, to the Madera County-Fresno County boundary line. (3) All of Fresno County lying west of a line beginning at Friant Dam and continuing southeasterly along the Friant-Kern Canal its point of intersection with the north boundary of Section 29, Township 13 south, Range 23 east; thence due east along said boundary line projected to its intersection with the east boundary of Township 13 south, Range 24 east; thence south along said east boundary of Township 13 south, Range 24 east and continuing south along the east boundary of Township 14 south, Range 24 east to the county boundary line. (4) All of Kings County. (5) All of Tulare County lying west of a line drawn southeasterly from the northwest corner of Township 15 south, Range 25 east on the Fresno-Tulare County line to the southeast corner of Township 17 south, Range 27 east; thence due south along said east boundary of Range 27 east to the Kern County boundary line. (6) Those portions of Kern County described as follows: (A) All of Kern County lying west of a line commencing at a point on Tulare-Kern County line at the northwest corner of Section 6, Township 25 south, Range 31 east; thence south along the west boundary of Range 31 east to the south boundary of Township 32 south, Range 31 east; thence continuing due south to the Los Angeles County line. (B) Rosamond Area. Includes all of Township 9 north, Range 14 west, Township 9 north, Range 13 west, and Township 9 north, and Range 12 west. (7) A permit authorizing use shall show the application site(s) for which it is valid, except that a permit need not show the application site(s) if a notice of intent to apply pesticide is required to be filed previous to any application. The commissioner may require that any application be made only under his direct supervision. (8) No application shall be made on any area situated within two miles of any cultivated commercial vineyard or cotton planting belonging to any person other than the owner of the property being treated unless there is a continuous air flow away from such planting, but in no case shall any application be made within one-half mile of such plantings. (B) During the period beginning March 16 and continuing through March 31 within the counties of Fresno, Kern, Kings, and Tulare. (10) The provisions of paragraphs (8) and (9) shall not apply to Dicamba or Propanil herbicides. (c) The provisions of this subsection apply to Dicamba, 2,4-dichlorophenoxyacetic acid, 2-4-dichlorophenoxybutyric acid, 2,4-dichlorophenoxypropionic acid, 2-methyl-4-chlorophenoxyacetic acid, or Propanil herbicides during the period beginning March 16 and continuing through October 15 of each calendar year when used in that portion of San Joaquin County bounded by a line beginning at the intersection of Sacramento, San Joaquin and Amador Counties; thence southerly along the San Joaquin County line to State Highway 88; thence southwesterly along Highway 88 to its intersection with State Highway 12; thence westerly along Highway 12 and 88 to the intersection of Clements Road to its intersection with an imaginary easterly extension of Eight Mile Road from its junction with the Calaveras River; thence west along this extension to Eight Mile Road; then west along Eight Mile Road to Thornton Road; thence south on Thornton Road to its intersection with Disappointment Slough; thence westerly along Disappointment Slough to the southeast corner of Bishop Tract; thence westerly along the southern edges of Bishop Tract, King Island, and Empire Tract; thence northerly along the west edge of Empire Tract to the southeast corner of Bouldin Island; thence along the southern and western edges of Bouldin Island to the intersection of San Joaquin, Contra Costa, and Sacramento Counties; thence northerly and easterly along the San Joaquin-Sacramento County line to the point of beginning. (2) No herbicide in an ester form shall be applied. (3) A permit authorizing use shall show the application site(s) for which it is valid, except that a permit need not show the application site(s) if a notice of intent to apply pesticides is required to be filed previous to any application. (4) No application shall be made on any area situated within two miles of any cultivated commercial vineyard belonging to any person other than the owner of the property being treated that existed prior to May 1, 1978. 1. The commissioner may require that all applications be made under the direct supervision of the commissioner's representative. 3. Only one aircraft shall spray at a given time on each of the two islands. (6) The provisions of subsections (4) and (5) shall not apply to Propanil herbicides. (a) Jet nozzles having an orifice of not less than one-sixteenth of an inch in diameter shall be used with such orifices directed backward parallel to the horizontal axis of the aircraft in flight. A number 46 (or equivalent) or larger whirlplate may be used. (b) Boom pressure shall not exceed 40 pounds per square inch. (c) Spray material shall not be discharged at a height of more than ten (10) feet above the crop or target. (d) Wind velocity shall not exceed 10 miles per hour. NOTE: Authority cited: Sections 407, 12976, 12981 and 14006, Food and Agricultural Code. Reference: Sections 11501, 12981 and 14006, Food and Agricultural Code. 6468. 1,3-Dichloropropene and Ethylene Dibromide. NOTE: Authority cited: Sections 407, 12976, 12981 and 14005, Food and Agricultural Code. (a)(1) Closed systems as specified in section 6000 shall be used for all mixing and transfers conducted by an employee. (2) Paraquat applications shall not be made within one-eighth of a mile of any school or any area zoned as residential where people are actually residing or other inhabited residential area designated by the commissioner. (3) DEF or Folex applications shall not be made within one-half mile of any area zoned as residential where people are actually residing or other inhabited residential area designated by the commissioner or any school in session or due to be in session within 24 hours. (4) DEF or Folex applications shall not in any case be made within one-eighth of a mile of any school. (b)(1) Jet nozzles having an orifice of not less than one-sixteenth of an inch in diameter shall be used on aircraft with such orifices directed backward parallel to the horizontal axis of the aircraft in flight. A number 46 (or equivalent) or larger whirlplate may be used. (2) Aircraft nozzles shall not be equipped with any device or mechanism which would cause a sheet, fan, cone, or similar type dispersion of the discharged material. (4) These cotton harvest aids shall be applied by aircraft only in combination with a viscoelastic thickening agent or other drift control agent approved as effective for such purposes by the Director of the Department of Food and Agriculture. (5) Except for the requirements of paragraph (4), this subsection does not apply to helicopters equipped with a Microfoil (R) boom operated at air speeds below 60 miles per hour. (c) Air carrier ground equipment shall not be used to apply DEF or Folex. This section supplements the label restrictions on the use of brodifacoum, bromadiolone, difenacoum, and difethialone. (a) It is prohibited to place any above ground bait more than 50 feet from a man-made structure unless there is a feature associated with the site that is harboring or attracting the pests targeted on the label between the 50-foot limit and the placement limit specified on the label. NOTE: Authority Cited: Sections 11456, 11502, 12781, 12976, 14005, and 14102, Food and Agricultural Code. Carbofuran (Furadan) shall not be applied to alfalfa located within one mile of nesting geese, widgeon or coots or to areas where repeated feeding of these waterfowl is known to occur. The following restrictions apply to all turf uses of fenamiphos (Nemacur). (a) Fenamiphos shall not be used to treat residential or institutional lawns or public recreation areas other than golf courses. (b) Fenamiphos shall not be applied with a knapsack or similar equipment that is placed on the applicator's body. (c) Fenamiphos shall be watered in immediately after it is applied with a minimum of one-half inch of water. Such water shall not be allowed to run off the treated area. (d) Unprotected persons shall be kept out of areas being treated with fenamiphos until 24 hours after watering, as specified in subsection (c), is completed. NOTE: Authority cited: Sections 407 and 14005, Food and Agricultural Code. Reference: Sections 14005 and 14006, Food and Agricultural Code. NOTE: Authority cited: Sections 407, 13145, 14005 and 14006, Food and Agricultural Code. NOTE: Authority cited: Sections 12981 and 14005, Food and Agricultural Code. Reference: Sections 12980, 12981, 14001 and 14006, Food and Agricultural Code. NOTE: Authority cited: Sections 12976, 13145, 14005 and 14006, Food and Agricultural Code. Use of pesticides registered for agricultural, outdoor industrial, and outdoor institutional use containing chemicals listed in section 6800(a) shall be prohibited below the high water line inside artificial recharge basins, unless the pesticide is applied six months or more before the basin is used to recharge ground water. NOTE: Authority cited: Sections 11456, 12976, 13145, and 14102, Food and Agricultural Code. Reference: Sections 13145, 13150, and 14102, Food and Agricultural Code. 6487.2. Inside Canal and Ditch Banks. (b) the pesticide is applied six months before water is run in the canal or ditch. 6487.3. Engineered Rights-of-Way Within Ground Water Protection Areas. (2) Upon written request, the Director may make a determination to allow the interim use of a pesticide containing a chemical listed in section 6800(a) on an engineered right-of-way within a ground water protection area, for a period not to exceed three years. The Director's determination shall be based on evidence that the available management practices are not feasible for a specific crop or site, and that there are no feasible alternatives for the specific crop or site. The formal request shall include a study protocol(s) that is acceptable to the Director to develop feasible alternatives or alternate management practices. The study protocol shall include a description of the objective, personnel, study plan, sampling methods including number of samples to be analyzed, data analysis, chemical analytical methods including appropriate quality control, timetable, and references, if any. The requestor shall submit a written progress report every six months. If the progress report does not support the submitted study protocol(s), or if a report is not submitted, the Director may rescind the determination to allow the use of the pesticide within a ground water protection area. (3) The Director will issue a public notice stating the reasons interim use has been approved under (1) or (2). The notice will be posted on the Department's Web site. 6487.4. Runoff Ground Water Protection Areas. Except as provided in sections 6487.1, 6487.2, and 6487.3, use of pesticides registered for agricultural, outdoor industrial, and outdoor institutional use containing chemicals listed in section 6800(a) shall be prohibited in runoff ground water protection areas unless one of the following management practices can be met and is designated by the commissioner on the permit. The management practice identified in (b), "Incorporation of the pesticide," does not apply to bentazon. (2) Upon written request, the Director may make a determination to allow the interim use of a pesticide containing a chemical listed in section 6800(a) within a runoff ground water protection area, for a period not to exceed three years. The Director's determination shall be based on evidence that the available management practices are not feasible for a specific crop or site, and that there are no feasible alternatives for the specific crop or site. The formal request shall include a study protocol(s) that is acceptable to the Director to develop feasible alternatives or alternate mitigation measures. The study protocol shall include a description of the objective, personnel, study plan, sampling methods including number of samples to be analyzed, data analysis, chemical analytical methods including appropriate quality control, timetable, and references, if any. The requester shall submit a written progress report every six months. If the progress report does not support the submitted study protocol(s), or if a report is not submitted, the Director may rescind the determination to allow the use of the pesticide within a ground water protection area. 6487.5. Leaching Ground Water Protection Areas. (2) Upon written request, the Director may make a determination to allow the interim use of a pesticide containing a chemical listed in section 6800(a) within a leaching ground water protection area, for a period not to exceed three years. The Director's determination shall be based on evidence that the available management practices are not feasible for a specific crop or site, and that there are no feasible alternatives for the specific crop or site. The formal request shall include a study protocol(s) that is acceptable to the Director to develop feasible alternatives or alternate management practices. The study protocol shall include a description of the objective, personnel, study plan, sampling methods including number of samples to be analyzed, data analysis, chemical analytical methods including appropriate quality control, timetable, and references, if any. The requester shall submit a written progress report every six months. If the progress report does not support the submitted study protocol(s), or if a report is not submitted, the Director may rescind the determination to allow the use of the pesticide within a ground water protection area. 6488. Antifouling Paints or Coatings Containing Tributyltin. (3) outboard motors and lower drive units. (b) Except as provided in subsection (a), antifouling paints or coatings containing tributyltin shall not be applied to any surface or object that will come into contact with the freshwater or marine environment. This prohibition includes, but is not limited to, use on docks, piers, nets and other fishing equipment. (c) Prior to purchase of antifouling paints or coatings containing tributyltin the purchaser shall present to the dealer a copy of the registration of the vessel to be painted or coated to verify the vessel type requirements specified in (a). In the case where no vessel registration exists or the paint or coating is to be applied to an outboard motor or lower drive unit, the purchaser shall submit a sworn statement to verify that the paint or coating shall be applied only to an aluminum vessel hull, to a vessel hull 82 feet or more in length, or to an outboard motor or lower drive. The sworn statement shall be made substantially in the form provided in Section 6574(b). NOTE: Authority cited: Sections 14005 and 14151, Food and Agricultural Code. 6489. Tributyltin Paint and/or Coating Additives. Economic poisons containing bis(tributyltin) oxide which are sold as "additives" to be mixed with paints or coatings shall not be applied, either alone or when mixed with paint, to any surface that comes into contact with the aquatic or marine environment including, but not limited to, vessels, piers and fishing equipment. NOTE: Authority cited: Sections 12781, 14005 and 14102, Food and Agricultural Code. Reference: Sections 12824, 14005 and 14006, Food and Agricultural Code.